Games that use music as a gameplay or storytelling mechanic have always interested me. I played guitar for six years, and I guess it has stuck with me. As such, Laser Disco Defenders, made by Out of Bounds and published by Excalibur Games drew my eye from the start. After a few hours with it, I can say that despite a few weak spots, it was worth it. In Laser Disco Defenders you assume control of a spaceship chasing Lord Monotone, a living walking sterotype of bad metal, symphonic music. Monotone wants to find an artifact, the Mirror Moon, with which he can force the whole galaxy to listen only to his music. Our spaceship group of four, representing the 70s disco scene in all its glory, has to chase him through various environments. 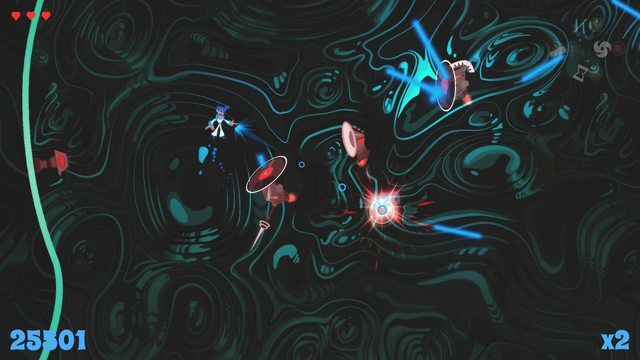 At its core, Laser Disco Defenders is a 2D action game with some light roguelike elements. After choosing one of the four characters, we descend through the game’s levels. Levels in the game are not that big in size. The catch is that, in contrast with most 2D games, here you have a jetpack. With it, you can not only walk on the ground, but also fly around the level. A level is cleared once every enemy on it is dead. Apart from enemies, levels have environmental hazards, which are different depending on the area of the game we are at. Every character has a set amount of hearts and, although (s)he can get more through killing enemies, they are few and far between, meaning you need to be careful. Most of the above is fairly standard stuff, or things you can easily get used to. The biggest innovation in the game and in my opinion one of the most enjoyable aspects of it is that shots never dissipate. Every shot you fire in a level stays in the level until you finish it. 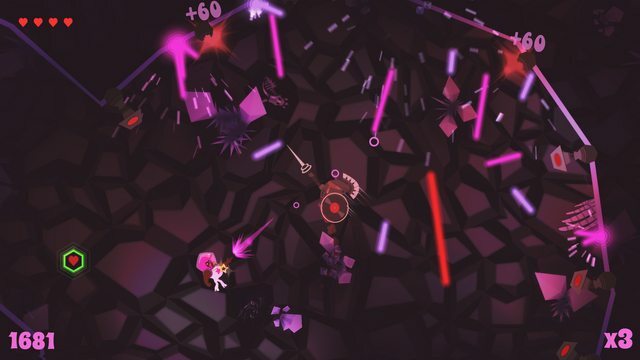 Once you shoot a laser blast, the laser moves through the level and rebounds on the walls. This means two major things. The first is that you can get some awesome triple or quadruple kills if you calculate your shots. The second is that you have two ways to play the level. You can either slowly move through it, shooting only when certain, or shoot all the time and rely on your dodging skills to survive your own shots. These two playstyles are complimented by the game’s characters. The four characters, Mr. Baker, Tommy, Donna and Liz all have the same two attributes, speed and health. Mr. Baker is the slowest but beefiest one, while Liz is very fast but can only take one shot. Personally, while I liked the fact that the game’s characters were built with the gameplay in mind, I’m disappointed that they weren’t fleshed out a bit more. I would have loved it if every character had his own “Ultimate Move” or quirk to differentiate them a bit more. A big plus for the game is its replayability. Thanks to its roguelike elements, every level is randomly generated. On top of that, there is a whole system of unlockables. During your run, if you manage to advance or complete one of three renewable objectives the game gives you, you increase the progress towards an unlock. These unlocks influence not only your character’s look, but also give them abilities, like a different way to fire lasers or defend themselves. While these can add some flavor to the game, they seemed too few to me. In terms of art and music, Laser Disco Defenders is fantastic. The soundtrack is some of the grooviest disco I’ve ever heard, while the game looks so colourful and fun. The clothes of the characters are the perfect mix of cheesy and sparkly. Generally, the game is a joy to look at. It also gets extra point for looking and playing as smooth as it is. All in all, Laser Disco Defenders is up there on my list. On the surface, the game doesn’t look like much, but once you delve into it, its simplicity in combination with a few smart gameplay elements elevate it higher than your basic run of the mill action game. If I could change some things about the game, it would be getting the characters fleshed out a bit more and adding some more content. Still, in its current state, Laser Disco Defenders is a very enjoyable experience. You can get Laser Disco Defenders on Steam for 10 euro. Although Laser Disco Defenders could do with a little more polish on some elements, its gameplay and looks is more than enough to carry it. While it doesn’t look as flashy as most games, once you peek past the lid, it’s a very fun experience with a few new gameplay stuff thrown your way. + Looks and sounds great. + Its gameplay, particulalry the way the laser shots work. – Could use some more unlockables. – The characters feel a bit samey. Welcome to Hyper Light Up!